Impaired hit & run on Whyte Ave! ***PLEASE share the s*it out of this and bring the justice that this douche bag deserves!!! If you see a Acura with front bumper damage, please get a licence plate. Specifically in Whyte Ave and Jasper Ave areas! 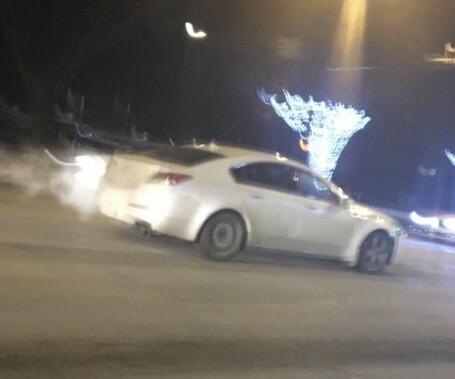 This Newer 4 door Acura hit us last night (March 2 @ 9:45pm) on Whyte Ave & 105 Street. It was parked on the road outside “BeerCade”, then abruptly pulled out side swiping our black Mitsubishi RVR while we were driving by Westbound. The car sped off and the licence plate was unable to be read. Witnesses near by said the driver was visually impaired. He was a Caucasian guy, short dirty blonde hair, and approximately 30 years old. His passenger was a female the same age range, with long wavy blonde hair. Ron Jabulin does that look like OEM wheel on the front and steelie on the rear? If they were in beercade they scanned their id’s. She will end up dry ratting, give it time.